In a city that has an annual Ice Cream festival and summer days that can reach 100+ degrees it’s safe to say there are a lot of options when it comes to chilly treats. But which cold confection connoisseurs have the most tongue tantalizing sweets? 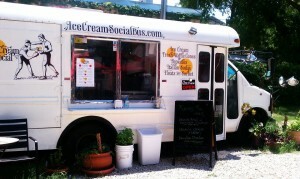 Royal Executive Transportation cruised the city to find the best ice cream and shaved ice shops in Austin. Don’t be surprised to find a line of 10 or so people deep anytime you swing by this food trailer. Luckily, they offer customers umbrellas to beat back the sun while they wait for a delicious sno cone that has ice so smooth it could be cream. They actually do offer a cream addition if you want to make your sno cone extra milky. One warning: the large selection of flavors will have you coming back to try more. Jim-Jim’s has been a 6th Street staple since it set up shop in 1994. Water Ice contains, you guessed it, water and ice as well as fresh fruit that’s blended together for a smooth, thick icy treat. If you’re on a diet or lactose intolerant the fat-free, dairy-free water ice is an excellent way to calm a sugar craving. The Lick slogan is ‘Honest Ice Cream’. What does that mean? It means Lick uses only pure ingredients that are locally sourced. For eco-conscious ice cream lovers it’s the best spot in Austin to get your cold treat fix. Location: Many check them out at the Amy’s Ice Cream website. Ice Cream Social is a throwback to the days when all ice cream treats were handmade. It’s hard to decide which is best – the ice cream, the toppings or the cones. Just go ahead and get a treat that loads up on all three so you don’t have to decide. If you haven’t tried boba tea you are in for a treat. This tapioca-filled Asian sensation is becoming increasingly popular, and nobody in the capital city does it better than Teapioca Lounge. They have an amazing selection of milk teas, slushes and smoothies that are often made with real fruit. Juiceland is giving health nuts a reason to get off the hike and bike trail and relax for a few minutes. Always super fresh, always super healthy Juiceland drinks and smoothies are also delicious. If you’re looking for a juice cleanse this place has you covered.